Former Venezuelan leader Hugo Chavez died from a long battle with cancer on March 5, 2013. He was a long line of authoritarians, dictators, and oppressors who annoyed the United States’ politicians and presidents throughout the last 100 years or so. This brings to mind the role of the government in bringing about change for better or worse in other countries. Yes, Monday morning play calling is always perfect and much clearer. On the other hand, the United States had to make decisions based on the best interests of their country just like Chavez supposedly did for Venezuela. Yes, for those who are sanctimonious when it comes to America’s history in determining leadership disputes, the President and Congress make decisions based on the best results for the United States at that moment with a collective eye toward the future. Many dictators were supported because it was thought that the United States would have more influence over that person than a Communist government. Stopping the spread of Communism was a major issue when deciding who to support. Once in power some of these dictators, like the Shah of Iran, abused their authority. At the beginning, contrary to the present, the United States was interested in nation building only for itself. 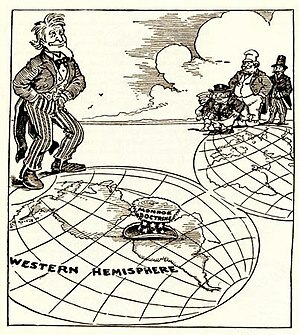 The Monroe Doctrine resulted in the United States intervening in many disputes in South America during its infancy and after 1900 to the present day. The Founding Father James Monroe knew the kind of price many people paid to secure liberty. He refused to let instability within other countries disturb his country’s quest toward economic and cultural stability. He simply said that the United States has a say in what happens in their hemisphere, be it South, Central or North America. Thomas Jefferson made the determination that the United States has a right to defend itself anywhere in the world when he sent the Navy and Marines to the Barbary States to defend our right to sail through their shipping lanes without paying a tribute for protection against the pirates in 1801. For the most part, throughout our history the United States remained a regional power and stayed out of European affairs until World War I. Afterward when President Woodrow Wilson tried to organize the League of Nations, he was stopped by his own Congress and the resolve of European victors for revenge toward Germany and its allies. 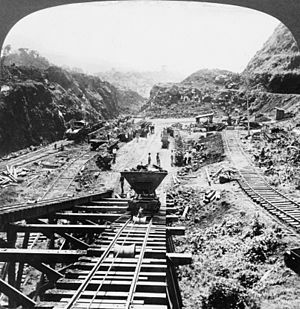 Completed the Panama Canal in 1914 and gave it back to the country in 1999. The canal is one of the chief revenue resources for the country today. The Marshall Plan, providing reconstruction funds for European Nations after World War II. The driving force for the establishment of the United Nations. World leader in space exploration and research. World leader in humanitarian aid. Forced the Iraqi Army out of Kuwait after Iraq invaded in 1991. Gave aid to the Kurdish people after the war ended. The thawing of relations between China and the United States. Making an effort to reduce weapons of mass destruction. Having stated this case, there are some who see the issue differently. Below are links that may have an opposite view. write a litte more on this subject? I’d be very thankful if you could elaborate a little bit further. Cheers! Thanks for the comment. I will be visiting this topic more frequently in the future. this site, as i want enjoyment, for the reason that this this website conations in fact fastidious funny material too. Thanks for visiting every weekend. I try to be funny and fastidiouos in just about everything I do. Thanks again for the comment. Thanks for the kudos. I try to be original with my posts and your words keep me motivated to find news to present ideas. I’d be very thankful if you could elaborate a little bit further. Cheers!